Now, imagine that one or two of those staph bacteria on the towel enter an open paper cut on your finger. Inside your body, they multiply. A few days later, what began as a simple paper cut is now puffy and seeping pus. Your finger is red and swollen. You visit an urgent care clinic. Ideally, you’d be prescribed an antibiotic that would kill the staph cells. But maybe some of those cells are able to resist that drug. They keep replicating, rapidly, in the face of treatment. All the while, the infection disperses throughout your body. 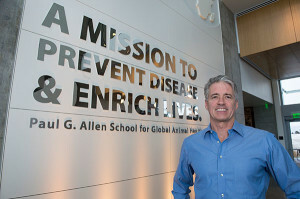 You have contracted a “community acquired” antibiotic-resistant infection, caused by certain gene-swapping bacteria flourishing beyond hospital walls, said Guy Palmer, regents professor and director of Washington State University’s Paul G. Allen Center for Global Animal Health. Whether you’re in Kansas, Costa Rica or Congo, “a series of seemingly innocuous events can lead to a potentially life-threatening situation where an infection defies the very drug designed to destroy it,” said Palmer, who serves on the National Academy of Sciences Board on Global Health. Palmer’s comments come on the heels of a recently issued stark warning by the World Health Organization (WHO). Common bacteria are becoming resistant to antibiotics in “every region of the world,” concluded authors of the new report. And though scientists and public health officials have been sounding alarm bells for more than a decade, this is the first time hard data have replaced global guesswork. It’s well-documented that without effective antibiotics people get sicker, stay sick longer, require more costly treatments and are more likely to die. Even so, antibiotic resistance is a tough topic to sell, said Palmer, whose work with the National Academy of Sciences involves advising the Institute of Medicine on health issues transcending continental boundaries—of which antibiotic resistance ranks high. U.S. Centers for Disease Control and Prevention illustration. 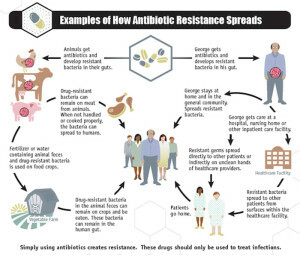 For example, a public misconception persists that resistance only impacts people who have taken too many antibiotics or have misused them, he said. “Even if you’ve never had antibiotics in your life, resistant bacteria can still be passed on through food, through water and soil, through contact with humans,” Palmer said; for example, through swallowing a mouthful of water downriver from a city or farm; eating undercooked poultry or meat; breathing in germs from a person’s cough. “This is not an individual’s problem; it’s a societal problem,” he said. And it’s exacerbated by modern air travel, where an antibiotic resistant strain of bacteria can be on the opposite side of the world one day and in the United States the next. “It’s said that any pathogen can move around the globe within 24 hours, but the same can be said of antibiotic resistance,” he said. Although resistance is a natural consequence of bacteria’s evolution – they change in order to survive – “we’ve fueled the rise of these pathogens with the inappropriate use of antibiotics in humans and animals alike,” Palmer said. Heightened awareness among the public, clinicians, policymakers and food-animal producers is crucial in order to reverse, or at least slow, the steady march of drug resistance, he said. On the human side, antibiotics have been overprescribed; on the animal side, they’ve been harnessed to spur growth. Palmer’s view is supported by scientific studies and backed by a growing list of leading health organizations, including WHO, the U.S. Centers for Disease Control and Prevention, the American Medical Association and the American Academy of Pediatrics. The U.S. Food and Drug Administration’s announcement late last year requesting voluntary phasing out of the non-medical use of antibiotics in farm animals is a good start, said Palmer. There are also signs of market-driven change. A growing number of U.S. companies, including Chipotle, Panera and Applegate Farms, now sell antibiotic-free meat and poultry. And in February, the popular fast-food restaurant Chick-fil-A announced plans to serve chicken not raised on antibiotics. Now that we’ve reached the tipping point of antibiotic resistance – worldwide and nationally – it will require a fundamental shift in how these drugs are viewed, what they’re used for and how they’re developed, said Palmer. 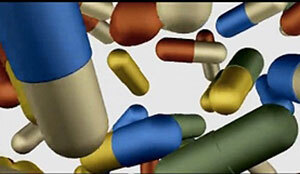 Today, new antibiotics on the market are rare while bacteria resistant to antibiotics are abundant, he said.